Free resources to promote the understanding and everyday use of QR Codes (a.k.a. QRickits) for personal and business purposes. If you have any comments or ideas to share, please let me know. 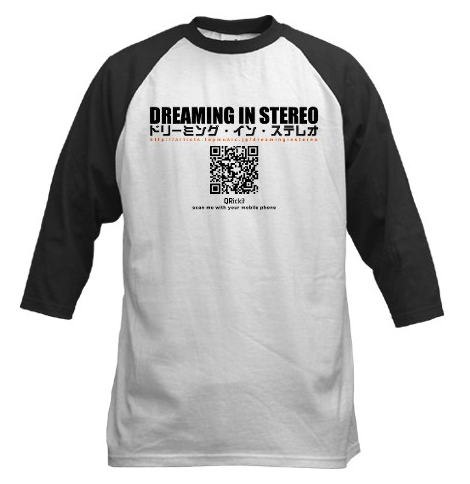 Check out the band Dreaming in Stereo. Their t-shirts are both a fashion statement and marketing tool. They are performing at SXSW next month in Austin, Texas. Click here to get your own custom design QRickit t-shirts. Get your own QRickit at QRickit.com! QRickit Invasion in Austin, Texas! QRickits will soon be invading Austin, Texas next month. Read article at Evolver.fm on what's happening at SXSW. I am a small, square barcode. You can find me almost everywhere. When you scan me with your mobile phone's camera I can help you do many things. Get your free QRickit below! * Google QR Code API is DEPRECATED! Instead use the free QRickit QR Code API to dynamically create and display custom QR Codes in your website, emails or online applications. Easy to use even for non-programmers. Click here for more info. To create custom QR Code images for use online and in print, use the free QRickit QR Code Creators at QRickit.com. Make your own website or blog more attractive! Add a free QRickit QR Code Widget (just like the one above) to your website or blog to let visitors create and download their own custom QR Codes.